Google announced the results of GSoC 2018 on 23rd April. Desparately pinging the website till 9'o clock at evening, I got to know about the results and I am happy to share that my proposal was among many projects selected. I will be working on Porting ViSP to Android devices with ViSP, Inria. You can find my project’s description here. I would like to thank Divesh Pandey, one of my seniors and GSoC'17 student at Red Hen Lab, who introduced me to GSoC and helped me whenever I asked for, while submitting the proposal. For next 12 weeks, I'll be collaborating with my mentors Fabien Spindler and Souriya Trinh at Inria, France. ViSP is already packaged for iOS. The objective of my project is to propose to the ViSP community an SDK for Android and a set of tutorials for beginners. I got familiar with the ViSP Tech Stack well before submitting the proposal. It was like the basics of development - install the software on your PC, going through the tutorials and demos and getting familiar with the code structure(I made a separate repo for this :D ). During the Community Bonding Period, we discussed a few important things like how OpenCV handles its Android platform and all. Just before the first week, I successful built visp using Android NDK(get the code here). First week - Demo time!! 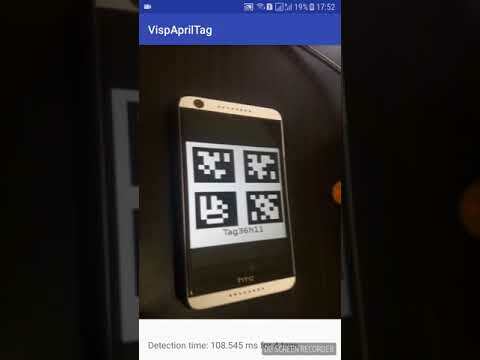 Since I got the build ready, I jumped to making some android apps(get the apps here) showing basics of vpAprilTag detection(a simple BW marker, useful for a wide variety of tasks including augmented reality, robotics, and camera calibration). The app worked well on latest android versions with reasonable detection time, using 4 threads on 640x480 sized greyscale images. But it lacked image processing and augmenting capabilites, which I worked on next. Soon I switched onto a new PR #323. Instead of focusing on the android platform, I worked on developing the Java module. Its better in a way that Java module can be tested on a desktop too and if sucessfully built, I'll need to make a few changes only to make it running on Android. We're working with JNI not Java, CMake not C++. There are no debuggers for both, so printf and message("Code reached here") become your buddies. Unlike traditional code, we're working on build scripts - so every failed build means following along the code to track what's creating the issue and then waiting for the next build to finish. Neverthless, I added scripts to detect Ant(Java command line tool to build files as targets) and Python SDK. Python is used to parse the C++ header files and generate JNI and Java code for it(refer this excellent opencv doc for more). Ant is used to generate classes from java file and compile it into a jar. As my mentors adviced, next few weeks I'll try to develop the visp_java module first and the android platform later. That way I can resolve issues better and track down their source, either JNI or Android architecture/platform itself.